I created an open source update of the ioquake3 port for the Raspberry Pi. The project is based on the latest ioquake3 codebase with an OpenGL ES renderer. The game runs on Pi Zero/1/2/3's with Raspbian Desktop or Lite. Timedemo four benchmarks at ~140 fps on a Pi 3 @ 720P without overclocking, so it's very playable on a Pi 2 or 3. The source code includes a smart compiler script and robust installer that will do most of the steps for you. You'll just need to install some prerequisites and add your pak0.pk3 file from the full version of Quake III Arena. The source code is available on GitHub (scroll down for the readme file). Documentation, game FAQ and Compiling/Installation Guide can be found in the wiki. Last edited by cdev-tux on Mon Jan 22, 2018 7:23 pm, edited 3 times in total. libibus-1-dev package can't be found. Using Raspian Lite - most recent - updated and all that. Try searching for a similar package name. The package name may be libibus-1.0-dev. Let me know what you find and I'll update the documentation. I got a chance to try it out. Originally when seeing this project I thought this was an update to use the Mesa GLES driver. After all, the existing Raspbian Quake 3 suffers from "failed to add service - already in use?" when full OpenGL+KMS is enabled, and it would be nice to have a modern replacement. However, this codebase has references to /opt/vc/lib with -lEGL -lGLESv2 that make it unclear. If intended to use the closed-source Broadcom driver, it should say -lbrcmEGL -lbrcmGLESv2 or else it won't link properly on Stretch. I then went down the path of testing Mesa GLES (dtoverlay=vc4-kms-v3d) anyway. Needed to add -lGLESv1_CM to fix linker errors. Unfortunately the menus aren't visible and rendering is choppy at 1080p (on a Pi 3). Is this project intended to support only the brcm VC4 driver? This project currently supports the Broadcom driver, but I’m planning to add support for the VC4 OpenGL driver. I also have an open request for help in the project wiki to find someone who can make the renderer modifications to work with the Mesa GLES driver. I didn’t write the OpenGL ES renderer, I just added it to the latest ioquake3 codebase, so I don’t have the expertise to modify it. The idea is to get a version out there that doesn’t have the serious security issues of the older version in the repository. Last edited by cdev-tux on Mon Jan 29, 2018 6:24 pm, edited 2 times in total. I updated Q3lite with more than 30 bug fixes/improvements and brought the codebase up to date with Upstream. A more efficient Huffman encoder/decoder was added which should lower pings a bit. [imho] This installation guide will succeed only if the default user "pi" has not been renamed. Mine was and the installation cannot bring itself to success. 3. RPi 2 + Maxell 16GB c10. Thank you for the feedback. Can you post the error message that you’re getting so that I can help to determine the cause? The compile/install script determines which user is logged in during installation and proceeds with that username, but it may need some additional logic to function correctly, so any error messages would be helpful. Thank you. -Wimplicit -Wstrict-prototypes -pipe -DUSE_ICON -DARCH_STRING="armv7l"
Also my username "misho" is just a renamed "pi" with a home folder of "/home/pi". For some reason a folder named "/home/misho" appeared after the compilation. I hope this feedback is enough for sorting out the problem. Nonetheless keep up the good work! Thanks, I figured that out. But what about the "parasitic" folder creation? with just $USER and $HOME. Although I can understand having a home directory that doesn't contain the user's name is a niche case that cdev-tux didn't test for. Last edited by jdonald on Thu Jan 11, 2018 4:33 am, edited 1 time in total. That’s great feedback. Thank you jdonald for your help with the renamed Broadcom library issue. Thank you misho.pitrov for your help with the user home directory issue. I pushed a fix to the repository to correct both of these issues. The compile/install script now has the logic to correctly determine the logged in user’s home directory. The script runs as root, so the $HOME variable points to root’s home directory. However, I was able to get around that. The renamed Broadcom library issue should be fixed as well. It will use the new libbrcmEGL.so and libbrcmGLESv2.so libraries if available; otherwise it will use the old libraries for compatibility with older versions of Raspbian. @misho.petrov, you’ll need to compile and install the “dev” branch (the default) to get these latest changes. Please try the new code and let me know if you have any issues. - this edition installed flawlessly on RPi2 with Stretch Lite, upgraded and updated. - "sudo q3lite" is not working - "command not found"
- I'm using the pak0.pk3 Quake 3 DEMO release (the initial version with only 3 levels) but I'm getting this message"
Check to see if you have the file /usr/local/bin/q3lite. Also verify that /usr/local/bin is in your path with "echo $PATH". I haven't tried the demo version files, so I don't know of anything else to try if it doesn't work. After you make the modifications that the ioquake3 wiki recommends, see if you're still getting the point release error message. I hope that helps to get things working for you. Last edited by cdev-tux on Sat Mar 17, 2018 8:33 am, edited 1 time in total. Try compiling again with the default "dev" code branch. It has additional bug fixes which should solve your issue. Let me know if that works for you. Thanks. However, it wont save config files such as keymaps etc, any idea why? 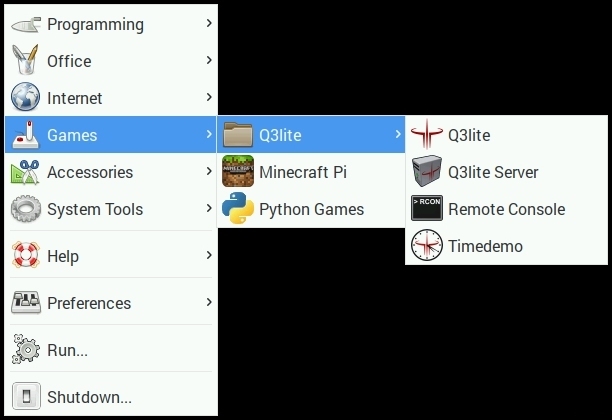 Might it be that q3lite somehow hardcoded so it want to save config files in user: pi home dir? Glad it worked for you. The default directory for config files is /home/pi/.q3a/baseq3, but if the user name is different than “pi” then the installer should detect the logged in user’s home directory and create a subdirectory there named .q3a/baseq3. Make sure your file manager is set to show hidden directories or it won't be visible. Well it does create .q3a under my home directory so that works as it should but it doesnt remember keymap for game, so iguess it cant find the correct path to store the config file in? Take a look at the ~/.q3a/baseq3/autoexec.cfg file. There’s a section at the beginning of the file entitled “Binds” for defining key bindings. You can define your key bindings there so they’re loaded when the game starts. You can also comment out that section with a “//” at the beginning of each line and set all of your key bindings in the game menu instead. What it does is it creates a new menu entry called Other/and links end up there but only until i reboot then it disapears completely, is this couse of its a dev version?